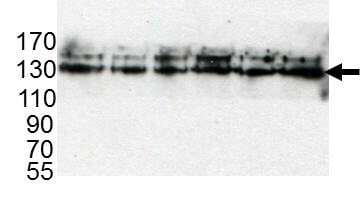 Rabbit recombinant monoclonal GM130 antibody [EP892Y]. Validated in WB, IP, IHC, Flow Cyt, ICC/IF and tested in Cow, Dog, Human, Monkey, African green monkey. Cited in 86 publication(s). Mouse and rat cell lines pc12, 3t3, raw 264.7 were tested positive in WB. However, brain, kidney, spleen and heart were negative from the two species. Synthetic peptide within Human GM130 aa 1-100. The exact sequence is proprietary. WB: HeLa, MCF7, MDCK(NBL-2), MDBK(BL-1) and COS-1 cell lysates. IHC-P: Human cervix carcinoma and liver tissues. ICC/IF: HeLa cells, ARPE-19 cells, Bovine brain microvascular endothelial cells, and monkey kidney cells. Flow Cyt: HeLa cells. Our Abpromise guarantee covers the use of ab52649 in the following tested applications. PFA fixation should be most suitable. WB 1/1000 - 1/10000. Detects a band of approximately 140 kDa (predicted molecular weight: 112 kDa). Immunocytochemistry/Immunofluorescence analysis of HeLa cells labelling GM130 with purified ab52649 at 1/50. Cells were fixed with 4% paraformaldehyde and permeabilized with 0.1% Triton X-100. ab150077, an Alexa Fluor® 488-conjugated goat anti-rabbit IgG (1/500) was used as the secondary antibody. DAPI (blue) was used as the nuclear counterstain. ab7291, a mouse anti-tubulin (1/1000) and ab150120, an Alexa Fluor® 594-conjugated goat anti-mouse IgG (1/500) were also used. Control 1: primary antibody (1/50) and secondary antibody, ab150120, an Alexa Fluor® 594-conjugated goat anti-mouse IgG (1/500). Immunohistochemistry (Formalin/PFA-fixed paraffin-embedded sections) analysis of human cervix carcinoma tissue labelling GM130 with purified ab52649 at 1/100. Heat mediated antigen retrieval was performed using Tris/EDTA buffer pH 9. ab97051, a HRP-conjugated goat anti-rabbit IgG (H+L) was used as the secondary antibody (1/500). Negative control using PBS instead of primary antibody. Counterstained with hematoxylin. ab52649 (purified) at 1/20 immunoprecipitating GM130 in HeLa whole cell lysate. Lane 2 (+): ab52649 + HeLa whole cell lysate (10µg). Lane 3 (-): Rabbit monoclonal IgG (ab172730) instead of ab52649 in HeLa whole cell lysate. 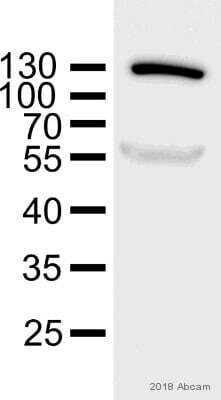 For western blotting, ab131366 VeriBlot for IP (HRP) was used as the secondary antibody (1/1500). Flow cytometry analysis of HeLa (human cervix adenocarcinoma) cells labeling GM130 (red) with ab52649 at a 1/20 dilution. Cells were fixed with 4% paraformaldehyde and permeabilized with 90% methanol. A goat anti-rabbit IgG (Alexa Fluor® 488) (ab150077) was used as the secondary antibody at a 1/2000 dilution. Black - Rabbit monoclonal IgG (ab172730). Blue (unlabeled control) - Cells without incubation with the primary and secondary antibodies. Irgm1 KO MEF were transfected with plasmids expressing wild-type or mutant Irgm1 proteins, as indicated. The cells were exposed to 100 U/ml IFN-γ for 24 h, stained with anti-Irgm1 and anti-GM130 antibodies, and used for immunofluorescence analysis. The experiment was performed 3 times, with at least 20 cells analyzed per group in each experiment. (A) Shown are images from representative cells. 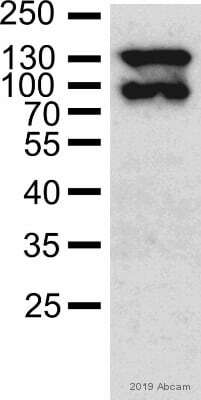 The scale bar represents 20 µm. Cells are 4% paraformaldehyde fixed, 0.2% saponin-permeabilized. Immunohistochemistry (Formalin/PFA-fixed paraffin-embedded sections) analysis of human liver tissue labelling GM130 with unpurified ab52649 at a dilution of 1/500. Unpurified ab52649 staining GM130 in Bovine brain microvascular endothelial cells by ICC/IF (Immunocytochemistry/immunofluorescence). Cells were fixed with paraformaldehyde, permeabilized with 0.1% saponin and blocked with 5% BSA for 90 minutes at 37°C. Samples were incubated with primary antibody (1/100 in 0.1% saponin + 1% BSA ) for 18 hours at 4°C. An undiluted Alexa Fluor® 568-conjugated Goat anti-rabbit IgG polyclonal was used as the secondary antibody. Unpurified ab52649 staining GM130 (magenta) in monkey kidney cells by ICC/IF (Immunocytochemistry/immunofluorescence). Cells were fixed with paraformaldehyde and blocked with 3% BSA + 0.5% Triton X-100 for 45 minutes at 25°C. Samples were incubated with primary antibody (1/1500 in 3% BSA + 0.5% Triton X-100) for 45 minutes at 25°C. An Alexa Fluor® 647-conjugated donkey anti-rabbit IgG polyclonal (2 µg/ml) was used as the secondary antibody. Nuclei stained with Picogreen. 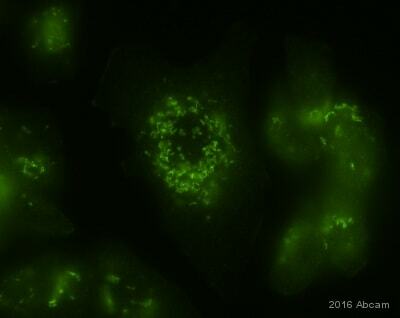 Unpurified ab52649 staining GM130 in human ARPE-19 cells by ICC/IF (immunocytochemistry/immunofluorescence). Cells were formaldehyde fixed, permeabilized by 0.5% TX-100 and blocked with 5% serum for 20 minutes at 25°C. The sample was incubated with the primary antibody (1/500 in 1% goat serum, 0.1%TX100, 1 x PBS) for 16 hours at 4°C. An Alexa Fluor® 488-conjugated Goat anti-rabbit polyclonal (1/500) was used as the secondary. ICC/IF image of unpurified ab52946 stained HeLa cells. The cells were 4% PFA fixed (10 min) and then incubated in 1% BSA / 10% normal goat serum / 0.3M glycine in 0.1% PBS-Tween for 1h to permeabilise the cells and block non-specific protein-protein interactions. The cells were then incubated with the antibody (unpurified ab52946, 1µg/ml) overnight at +4°C. The secondary antibody (green) was DyLight® 488 goat anti-rabbit IgG - H&L, pre-adsorbed (ab96899) used at a 1/250 dilution for 1h. Alexa Fluor® 594 WGA was used to label plasma membranes (red) at a 1/200 dilution for 1h. DAPI was used to stain the cell nuclei (blue) at a concentration of 1.43µM. Publishing research using ab52649? Please let us know so that we can cite the reference in this datasheet.